David Higgins, his wife, Yvonne, and their 5-year-old daughter, Hannah, are recovering at Miners Colfax Medical Center in Raton, N.M., after they were trapped in their GMC Yukon beneath four feet of snow for nearly two days. Rescuers found the family lethargic and holding on to one another early Wednesday. Fortunately, the Higginses, who were heading to northern New Mexico for ski trip, had plenty of food and water, and could use their cellphone to call for help. 1. Always drive with at least three-fourths of a tank of gas during the winter months. In an emergency, you will need as much gas as possible. 2. Pack a fleece blanket, emergency food and a first aid kit in the interior of your car. In an emergency the trunk might not be accessible, and fleece is one of the few pieces of material that retains its ability to provide warmth if it gets wet. 3. Have a container in the car that is capable of holding snow. In an emergency it may be necessary to collect snow in order to hydrate. 4. Replace all the interior light bulbs with LED bulbs. LED bulbs use about one-twelfth of the energy of an incandescent bulb and cost less than a tank of gas. In an emergency, conserving the car battery is extremely important, and the LED bulbs make a big difference. 1. Don't panic and don't rely on your technology. Survival is never about technology and always about temperament. In many cases cell phones and GPS devices may have been disabled by the accident or will not have service. However, if they are functional, they should be used immediately. 2. Always stay in your vehicle. If people are coming to look for you there is a better chance they will see a car than a person. You will also be able to survive for longer in your vehicle than in the elements. There are only two circumstances in which you should leave the vehicle. The first is if you are familiar with the surroundings and are certain it would be easy to walk to safety. The second is an option of last resort in which you believe you have absolutely no chance of surviving unless you try to walk to safety. 3. Keep your seat belt on. In winter conditions it is likely that other drivers may slide into your vehicle after it has become stuck. 4. Crack the back window slightly. Oftentimes the tail pipe is obstructed by snow, which can cause deadly carbon monoxide fumes to get into the vehicle when the engine is running. 5. Run the engine for 10 to 15 minutes every hour. 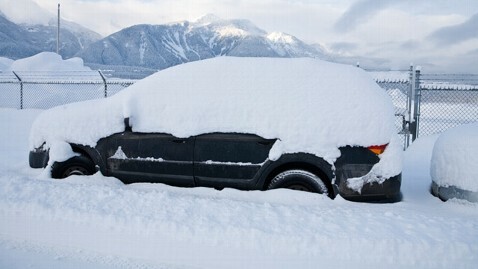 This will allow you to heat the car, melt snow into water and even warm a meal if you have packs of survival food. It will also conserve gas and prolong the life of both the engine and the battery. In an emergency, the vehicle is your lifeboat, and you want it to be functional for as long as possible.